Necessary For A Healthy Nervous System And The Utilization Of Fats! Vitamin B-12 (Cyanocobalamin) is a water-soluble vitamin necessary for the maintenance of a healthy nervous system and for the metabolic utilization of fats and proteins. 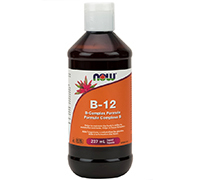 Vitamin B-12 is also essential for the synthesis of DNA during cell division and therefore is especially important for rapidly multiplying cells, such as blood cells. In addition, adequate intake of Vitamin B-12, along with Folic Acid and Vitamin B-6, encourages healthy serum homocysteine levels, thereby supporting cardiovascular health. Because Vitamin B-12 is found only in animal products, strict vegetarians are at risk of developing Vitamin B-12 deficiency and may benefit from supplementation. Directions: Shake well before use. As a dietary supplement, in the morning, take one dropperful, hold in mouth for 30 seconds, then swallow.